It's done! The shawlette that I wanted to wear to my friend's wedding was finished the night before the wedding! Shhh...I didn't even block it, that's how last minute it was!! Then as it turns out, I didn't even wear it! I know. WTF? Yeah...I didn't wear it. 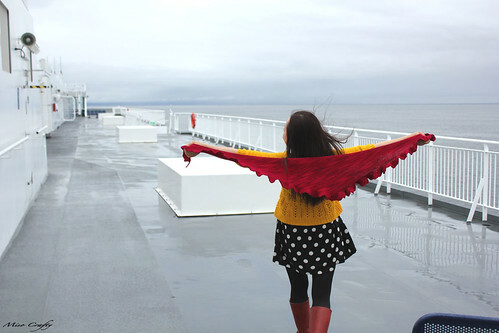 As you saw in this post I ended up wearing my Queen Bee cardigan instead and thought that the shawlette would be overkill. 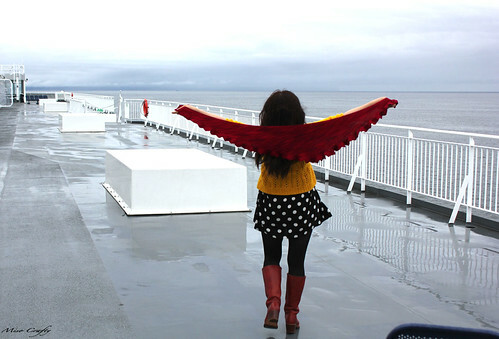 I did bring it with me and had an impromptu photo shoot on the ferry heading to the mainland. But that was the only time I donned it. Unfortunately Brett didn't know how to use my new camera and so a lot of the photos came out blurry. Oh well. Seriously. That's it. That's 12 inches of yarn that you're looking at there. I'll admit that at the very end I had to fudge it a bit to make sure that I could even bind off the 4 stitches that I was suppose to have left. I don't think you can tell, cause not even I can tell the difference between my fudged version and one that's done correctly, so I'm pretty sure no one else can distinguish the difference either. Another "oops" in my finished shawlette - I managed to knit 5 of the ruffles a garter ridge short. These ruffles were knit at the very beginning before I got into a rhythm (and were knit whilst watching hockey!) and it took everything I had to not think or even look at it cause it really bugged the perfectionist in me. Again, you can't even tell when looking at that section and there really was no point in me ripping back about 10" of work just to fix it. Luckily I got distracted with my rapidly diminishing ball of yarn to notice the ruffles any more! Two quick notes about this project: 1) this does not count as one of my 12 in 2011 projects since the yarn was bought this year and so was the pattern (which I had brought promptly before casting on and after realizing none of the patterns in my repertoire was suitable to what I wanted) ; 2) this is my first Wollmeise project! I've been hoarding collecting the yarn as if sheep were gonna become extinct tomorrow. 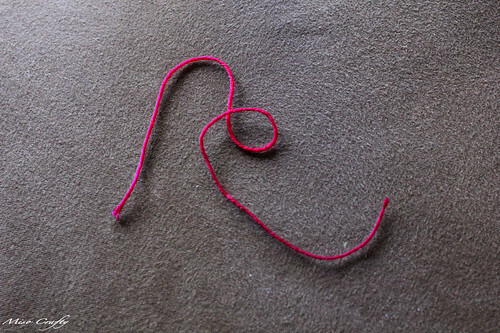 I must say I absolutely loved watching the saturated red and pink colours slip through my fingers as I knit, but I don't think I really care for the yarn itself. I know, am I crazy?!? But I found it to be quite splitty and snags pretty easily, which then makes the splitty aspect even more pronounced because there's a ply within the strand that's sticking out making your work look all messy and uneven. If you're a perfectionist like me, this will drive you nuts. I'm definitely going to do another project with Wollmeise and decide for sure if I want to keep on avidly collecting the yarn. The beautiful, saturated colours are almost enough to say yes, but will I like how it knits up or most importantly, how it wears? We'll see, I guess. I did have a few close ups, but the camera was on the wrong setting and so the photos ended up quite blurry. :( I'll try to get some in the next few days, but another thing about this project is that the colour is so hard to capture!